April means Spring, and Spring means flowers, so I choose roses as the main spot for my new layout for the DCWV sketch challenge ! The picture was taken long ago in Scotland, in the Dunnotar castle (or what's left of it). this place is incredible ! You can only access by foot because it's a rock into the sea, you have to climb to go there ! This castle is full of Scottish history, take a tour to the web site or to my old post about it. 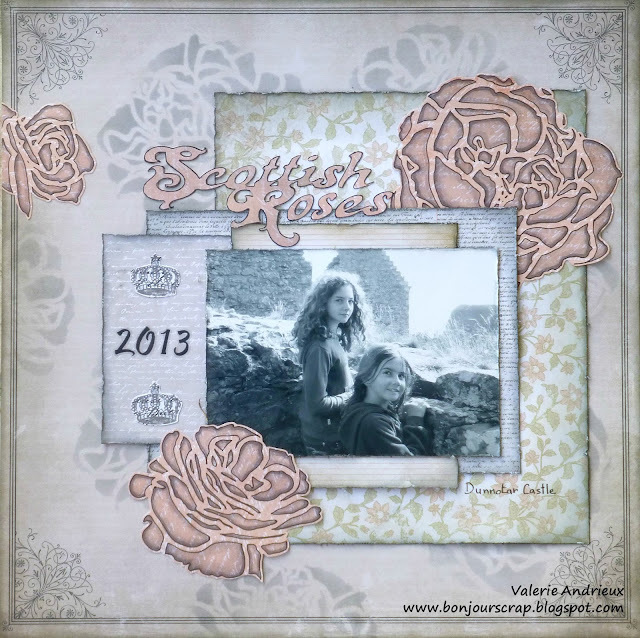 Anyway, once I found the pictures, I choose to work with the Script and notes stack by DCWV and the 12x12 roses stencil by TCW. I use the stencil on the background with Black sooth distress innk (Ranger) and on pink paper as a template for the cut flowers. This pink roses were colored also with gray Copic markers. You will have until the end of April to create a layout from the above sketch. Have fun !